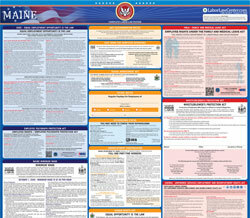 The Whistleblower's Protection Act Poster is a whistleblower law poster by the Maine Department Of Labor. This is a mandatory posting for all employers in Maine, and businesses who fail to comply may be subject to fines or sanctions. This poster must be posted in a conspicuous place where all employees will see it. This poster describes the protection whistleblowers have from their employers and how to report violations, unsafe conditions or practices or illegal acts in the workplace. It appears you don't have a PDF plugin for this browser. Please see the link below to download maine-whistleblowerprotection.pdf. 5. You have been involved in an investigation or hearing held by the government. 2. You have good reason to believe that your boss will not correct the problem. TTY users call Maine Relay 711.